Since I recently posted the instructions for cooking with dried beans, I suppose I should probably follow up sooner rather than later with a recipe to get you started. 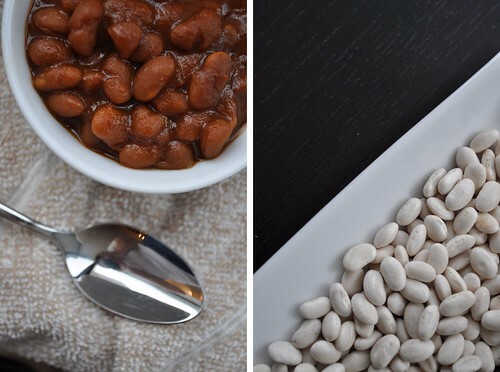 This one is super simple—the beans only require soaking—and is a definite keeper. Some small part of me wishes I could take credit for it, but the bigger part of me is just glad that I found it. The recipe is for vegetarian baked beans, and it comes from Joel over at Well Preserved. I adore baked beans. As a kid, I used to crack open cans of a certain well-known brand and eat them by the bowlful. I’m not saying they were “all that” (90s flashback), but they created a general preset in my mind for what baked beans should taste like. We all know how that happens—like how some people love that powdery Parmesan cheese in the green can or how New Yorkers have their assertions about what real pizza is. I’m sorry, but this one really gets me. I love New York and this city is my home—I’ve even adopted the phrase “waiting on line”—but I’m still of the opinion that pizza is valid and delicious in all its forms. Thick crust, thin crust, deep dish, brick oven, coal oven, whatever. Of course I now have an obvious personal bias toward the GF varieties…but that’s not my point. What were we talking about again? I’ve had some in recent years that were less flavorful, or more on the tangy side, or some with an unexpected and violent kick of spice. They’ve been good in their own ways, but there’s something about that classic baked bean taste. It’s ingrained in my mind and nothing else can really compare. 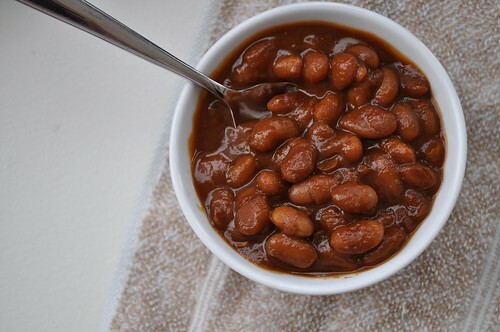 These days, I buy very few things in cans—with the exception of certain tomato products and the occasional last-minute beans—so I can pretty safely say that it had been years (plural) since I’d had a batch of baked beans that really satisfied my craving. I’ve loved the idea of making them myself, but all the recipes I’d come across required, well, baking. We’re still working with a make-do set of nonstick cookware over here that is not oven-friendly, placing such recipes in the “someday” category. So, I may have squealed aloud in delight when I came across this one. You make the baked beans in—get this—a slow cooker. So genius, so obvious! And to make things even better, they’re vegetarian. While I can’t apply any definitive labels to myself, I will say that I now eat a mostly vegetarian diet. After trying these beans, I don’t know that I even remember what the pork is supposed to add. I just know I wasn’t missing it. Chris wasn’t missing it either. Between the two of us, we ate almost the entire pot the first time I made them. I know—yikes. 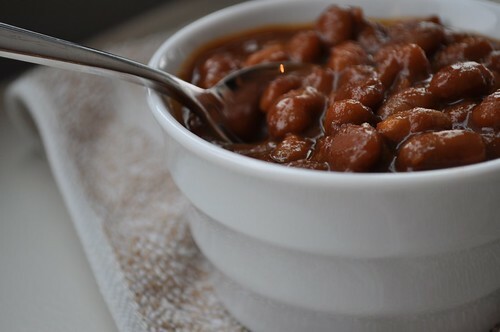 These baked beans are darkly sweet, slightly tangy, subtly smoky, and filling from the tongue right down to the toes. They’re comforting in the winter months, but I could easily imagine they’d fit right in at a summer barbecue. They’re an eat-by-the-bowlful kind of baked bean. And we do. A word to the wise—try making these on a day when you’ll be out of the house for an extended period of time. Set them going before you head out for work, schedule a shopping trip, take a long walk. They smell torturously good while cooking and hanging around waiting for them to be done can be borderline painful. Heat the olive oil in a small skillet over medium heat. Add the onions and sauté until translucent. In a medium bowl, whisk together the ketchup, brown sugar, molasses, tomato paste, Worcestershire sauce, dry mustard, garlic powder, and salt. Once combined, whisk in the vegetable broth. Add the beans, onions, sauce mixture, and water to your slow cooker and stir everything together. Cook on the high setting for 8 hours or on low for 12 hours. *Choose a Worcestershire sauce that doesn’t contain anchovies. Any brand would work well, though, if you’re unconcerned with making the recipe strictly vegetarian. Sounds really good. I've never made my own baked beans, but I'm going to try yours. BTW, I met you in the supermarket the other day & told that I read your blog, but I didn't confess that I've never followed one of your recipes. Now I will. Thanks so much! It was great meeting you. I hope you enjoy this recipe as much as we do. Hi Shirley! I’m not totally certain what you’re asking, but let me take a shot…. Soaking dried beans does not soften them. It rehydrates them a bit, but, yes, they will still be hard when they go into the slow cooker. It’s been a while since I’ve made these, but as far as I recall the amount of liquid was appropriate. Hopefully this answers your question!